As a surfer and a writer, when I saw that my assignment was to write about the top five international surf spots, I did a few cartwheels and a handstand. Top five surf spots? Easy money, baby! However, after some careful consideration, I found that listing the top five surf spots is like listing your top five family members. No matter how you do it, you’re bound to leave something/someone off the list. Since this assignment was all mine from the get-go, I decided to take some criteria into consideration. Top priority went to locale. For example, a top spot is not only consistent, but fairly safe to surf (i.e.,travel wise, as well as in the water). 5 INTERNATIONAL SURF SPOTS, in order from 5-1. Why is one of the world’s most famous right-handed waves listed last on this top five? Well, due to the criteria, J-Bay has its flaws. Twenty-years-ago you could probably luck out and surf there an entire week with nobody out but you and your boys. Nowadays you can’t surf a sloppy 2 - 4ft day without getting dogged on every other wave. The liquid locals are a bit of concern as well. J-Bay gained a lot of notoriety in the ‘70s and ‘80s from the exposure the surf media gave it. Since then, developers have taken over the once rustic campgrounds and are trying to turn it into another Huntington Beach. Another flaw of surfing Jeffrey’s Bay is the locals. The long-toothed, white-bellied version, that is. White sharks have become a consistent presence in the waters off of South Africa and have ruined many an epic session. Despite its flaws, however, Jeffrey’s Bay is the wave that most surfers dream about. It needs a good south swell, but when it’s firing, the lines will march in consistently and you can expect a nice heavy roller until you get to the inside, when the wave hollows out and you find out the name of the 2nd part of the wave, Supertubes. Now, before everyone gets their feathers ruffled, let me set something straight. I could write a Top 100 Australian surf spots and still leave some out. There are too many incredible breaks in Australia and I’m not going to let the abundance of quality Australian surf take this top five list over. Kirra is every surfers dream wave. It’s the wave most young surfers sketch on the peachy folders. Hollow, right-handed barrels peeling down the line in water that rarely dips below the 70s. The wave is rare in that it barrels from start to finish, a rarity. 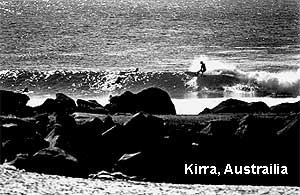 Another rarity about Kirra Point is the fact that it breaks on a sandy bottom. Therefore, if you happen to take a spill, there won’t be any reefs or rocks waiting for you underwater. The downside? The reasons I just listed have been passed on from older surfer to younger surfer for many years already, and the crowd situation has been overbearing. Anytime there’s a decent swell and the weather is nice, forget about Kirra point, unless your last name is Slater or Fletcher. The crowds make South Coast Plaza the day after Thanksgiving look downright feeble. Well, again Baja is home to so many incredible breaks that it deserves its own top five list, but Natividad deserves to be at or near the top of any list. The break itself is a clean “A-Frame” that breaks both ways. Any surfer on any wave has the choice to right or left and chances are they’ll score some of the best surfing they’ve ever witnessed. The sandy bottom is a gigantic plus, but don’t forget your full-suit as the water is a bit chilly. However, one of the most alluring advantages of surfing Natividad is the locale. You cannot drive to this break. It’s on an island off the coast of Baja, so you need to get there by either boat or small airplane. That means perfect, sandy bottom surf with very little crowds whenever this place is firing. As with all surf trips in Mexico, bring someone who can speak Spanish or a decent Span/Eng dictionary. Stay out of trouble and don’t drink the water unless you HAVE to. They’ve come a long way with some of their water-treatment programs, but just to stay safe bring your own or buy bottled down there. It seems that to find a truly epic surf destination, the crazier the name, the better the surf. G-land was once one of the timeless, rural surf destinations attracting surfers from all over. Clean, uncrowded waves breaking just off shore of an island where the jungle literally runs right up to the beach before screeching to a halt. Surfers once had to either chip in to rent a boat to camp on and dock in a bay close by or brave it by camping on the shore, which meant uninvited guests like monkeys, malarial-mosquitoes and, oh, say a large Jungle Viper or two. Some surf purists won’t agree with what I’m about to say, but civilization has somewhat saved G-Land. There are many surf camps there that run well-organized, clean ships anchored just outside the break. Now you can sleep on a decent cot or bed, eat three good meals a day prepared while you’re out in the water, and have plenty of cold beers waiting for you to ease away those achy arms when you get out of the surf. The wave itself is fast and hollow. A peeling left-handed wave, the spots hold anything from 1-2 to 8-12 foot, and, surprisingly, the bigger the better. One of the traits that set surfers apart from all other athletes is the desire to find better waves. No matter how good 204 might be tomorrow, Baja Malibu might be two feet bigger and more-hollow. The insatiable drive to find liquid perfection has taken surfers, quite literally, around the world. These trips can be rewarding both spiritually and physically, and with the right approach, can be done without taking out that eighth mortgage on the house. Some obstacles, whether natural or otherwise, still remain. Careful planning and the right contacts can make all the difference so pack plenty of wax, sunscreen, water and jeans, and nut it up. The time to hit the surf trip of your dreams is now.